Donald I. Cadle, Jr., DMD offers dental crowns and bridges at his New Port Richey, FLpractice. Crowns can repair and protect damaged teeth, and bridges can replace those that are missing. Dr. Cadle plans all treatments with great care, and he is especially precise when preparing for crowns and bridges. He will conduct a complete exam, keeping you fully up-to-date about your oral health. In collaboration with our partner lab, he will design restorations made from a variety of durable materials. Whether you choose metal or an advanced, tooth-colored material, your crown or bridge will maintain your natural bite alignment. Contact our office today to learn more about dental crowns and bridges. A crown will completely cover a damaged tooth, restoring functionality and preventing additional damage. Popularly known as a “cap,” this type of restoration will match the shape and color of your natural teeth. Dr. Cadle may recommend a crown if you have a cracked or weakened tooth. He can also use a crown to restore an infected tooth or a tooth with a very large cavity. In a few cases, he may suggest this type of restoration if you have a tooth with severe cosmetic flaws. To place a crown, Dr. Cadle will reshape your tooth. He will remove damaged or decayed material, and he will also make a more secure base for the restoration. He will send impressions of your tooth to a lab, our trusted partner for the last 35 years. The technicians can use several different materials to create your crown. 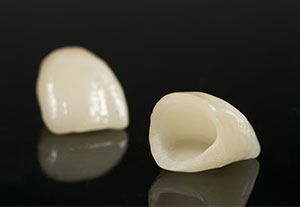 If your crown is for your front tooth, they will typically use porcelain ceramic. If it is for a back tooth, they can use porcelain ceramic or gold. It will usually take between ten days and month to complete your crown. When it is finished, Dr. Cadle will check the fit and attach it to your tooth. A dental bridge is so named because it literally “bridges” the gap left by missing teeth. This type of restoration is made of several crowns attached together. The exact size of the restoration will depend on the number of teeth that you wish to replace. Crowns on each end will fit over your healthy teeth to hold the bridge in place. The fabrication and placement process for dental bridges is much the same as it is for crowns. Dr. Cadle will reshape your teeth. Then he and the lab will design a restoration to match the appearance and alignment of your teeth. 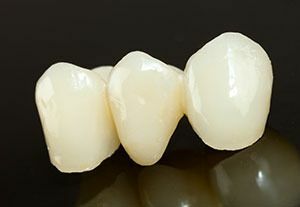 Like crowns, bridges can be made of metal or porcelain ceramic. In addition to traditional bridges, you could choose implants to replace your missing teeth. These small posts will support a permanent crown or bridge, which will never slip out of place. Whatever type of restoration you are going to receive, Dr. Cadle will carefully plan your procedure. He will begin with a thorough exam. In addition to evaluating your damaged or missing tooth, he will perform a cancer and periodontal screening. He will also check your surrounding teeth, measure your bite, look for any tooth movement, and record all findings. Throughout the entire process, Dr. Cadle will keep you completely up-to-date so that you can make an informed decision about your care. To learn more about dental crowns and bridges and to begin planning your treatment,contact Dr. Cadle’s office today.